Tybalt couldn’t quite believe how amazing a time he had had with Rhi, it had been the perfect little break with her. The man had never spent a lot of time around Australia, but the time that they had spent together recently had been truly amazing. Spending time Rhi was easy, she understood so much about how complicated his life could become, he understood how complicated her life could get. They were both in a similar field and though it had some major differences, the principal was just the same. Things were different from when they’d been friends at Hogwarts, for one there was more kissing involved now. They were going on dates while hanging out, on the cusp of something happening properly between them, and Tybalt feeling a deep desire to make it official. It would be complicated, she was living in Australia and he was living in New Zealand, but he knew that he’d want to make it work. Their schedules would crazy but they would just need to work at it. He hadn’t felt this good about dates in a very very long time. The man was lightly holding her hand, standing in a line for a fast food restaurant that Tybalt hadn’t visited in years. Medical resident, hufflepuff head girl 2040.
what a day it had been. when Tybalt had arrived at her apartment that morning ready for a day in Sydney Rhiannon could hardly believe how much fun it had been. It had been ages since she had taken her camera out for a walk. but they had quickly loaded up with their equipment. which Rhiannon was really glad for magic so she could fit everything in a handbag and not look like a real tourist. before they apparated to Sydney. they started with a takeaway coffee and pastry sitting on the bridge at the darling harbour before catching the ferry around to circular quay and got someone to take a picture of them as they passed with the opera house in the background. their next stop had been the rocks where they had walked up the lanes pausing when she saw an interesting building or him an interesting angle that needed to be captured. From there they had gone into the city proper. they visited the queen victoria building, a shopping centre with such lavish design and stained glass that made you feel like a Victorian aristocrat. they had then wandered through the city to the botanical gardens soaking up the late autumn sunshine that was where she had taken her favourite picture of the day, a candid shot of him sitting on the grass laughing with water glittering in the background. 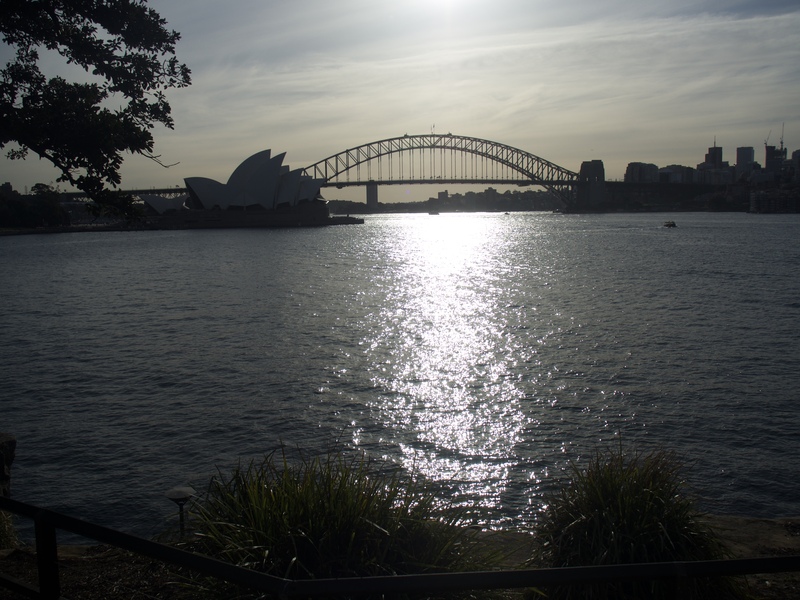 they had returned to the circular quay and were now standing as McDonalds waiting for their order that they would keep warm with magic as they went to Mrs Mquarie point for sunset. she felt him move beside her and turned to face him. She nodded as he said he was going to change his contact lenses for glasses. she felt her cheek warm slightly as his lips touched it and returned the kiss watching as he left for the bathrooms. It was weird. as a doctor, she had to handle a lot of things that made people squeamish. blood didn't bother her. she actually had enjoyed her time in surgery. infections we could deal with easily. but the one thing that made her squeamish was eyes. the thought of contact lenses and Intravitreal injections made her shudder. she didn't mind people wearing them at all. but the thought of putting something in her eye or watching people do it made her feel weird. " number 84" came the call from the register and Rhiannon moved forwards to collect their bag of food. as soon as they were out of the way of watching eyes it would be charmed and put in her handbag that was way to small to hold it. she waited for Tybalt to return before they set back out into the harbour pausing in a corner pretending to look at the price of tickets for luna park when really they were packing the food away. they then started to make their way around the water edge to their last stop hand in hand and a smile on her face. "those clouds mean that it is going to be an amazing sunset" she said. looking up at the sky as they walked. they would amplify the oranges and golds. she would probably have an advantage with the photos here being able to take advantage of the colours. but Tybalt had a great way of seeing things. and she couldnt get anyhing near as good a picture as him when her camera was set to black and white. Tybalt made his way to the bathroom, and from within his bag fished out the equipment to take his contacts out. 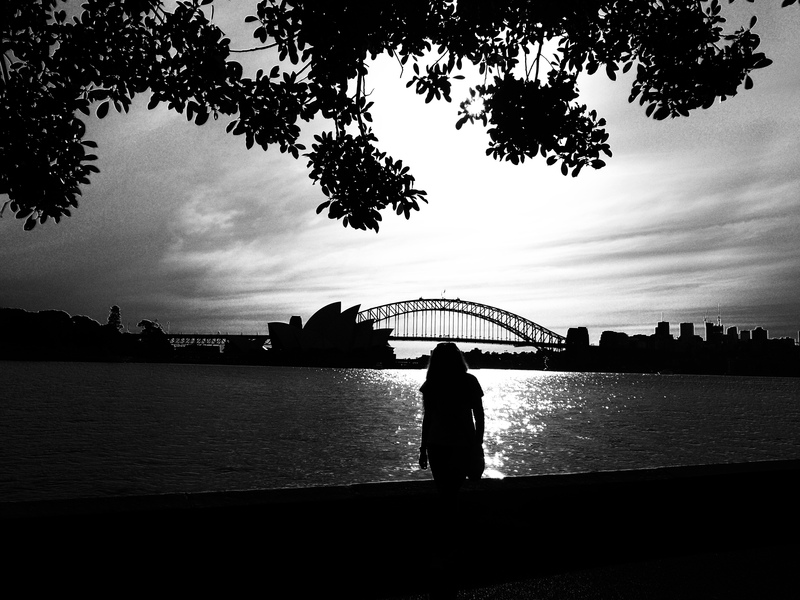 He’d taken a lot of great pictures that day, it was true that Sydney was a beautiful place to take pictures in. It took his breath away easily, though so had Rhi countless times during the day. It had been such a long time since he had used his camera equipment, most of it had gathered a small amount of dust, but the challenge of it was quite nice. He had liked taking pictures of Rhi, he liked taking pictures of the scenery. It was a perfect day. The man washed his face, and slipped on his glasses. He packed everything away and headed back out to where he had left Rhi. He liked the familiar feel of the glasses on his face. He put his arm around Rhi easily, it had been nice, he hadn’t taken as many pictures in the entire time he’d left school than he had in this one day with her. It had somewhat waned as a passion of his, too busy with work to do it, but he was glad to have had the chance to rediscover it. It was comfortable with Rhi, in a way he hadn’t felt comfortable around someone in a long while. Part of Rhiannon felt a little self-conscious walking with Tybalt. it was not something she was used to and he was, after all, a very good looking man. but it just felt so comfortable. it was nice just being close to someone that she knew and knew well. as they made their way the last little bit towards their destination Tybalt asked her to describe the clouds. "hmm" she thought for a second. it was hard trying to describe the colours of a sunset to someone who didn't see colour. she had never even thought about it before. "well. behind the opera house, the sky is golden. yellow and orange like a fire, not a wildfire, but the kind of fire you see in the fireplace to welcome you home." she said. not sure if that was the best way to describe it. "this fades to a cool pink like dusty flower petals which in turn fades to a soft feather blue, it has the texture of cotton wool with the pattern of fish scales in a type of cloud my mum calls kipper clouds" she said finishing the description as their reached their destination. she wasn't sure if it was a good description or not. words had not been one of her talents. she paused as Tybalt asked her to stay still. as he took her photo. she smiled watching him take the picture. she held her camera in her hand out of the way but angling it towards him pressing the shutter as he was there. it would probably not be a good be a good photo. but if it worked it would be. he sat beside her and she had one more thing to add to the description of the sky "It looks sort of like how this feels" she said leaning forward and kissing him lightly on the lips. at least she hoped that it felt the same for him as it did for her. she put her arm around him and enjoyed the sound of the water and the smell of the fresh air tinged with fast food. "It has been the most fun I have had in ages" she said thinking back to the adventure of the day. and then trying to remember she had a day with this much light-hearted effortless fun. she reached into her bag and drew out the food. passing him his serving and drink and taking a bite on one of her chips. it was nothing fancy but it was perfect for today. sure they were both adults, both doctors. they could certainly afford something fancy. but that would spoil the fun mood of the day. rhiannon realised that maybe her description was not quite what Tybalt wanted. she had tried to describe the colours as a texture but maybe it hadn't been what he was expecting. she remembered back to her time on a ward when she had been a student doing rotations. she had had a patient with synesthesia that she had done a case study on. it had been a really interesting case. it seemed that her second way of describing it had worked better. she felt the kiss warm her she smiled as they parted and put her arm around him looking not at him but in the same direction. she nodded as he said that this had been easy. it had been one of the easiest dates she had been on. even easier than with Perseus. she took a mouthful ofher food. not sure what to say in reply. she liked him and she liked spending time with him. the next thing he said was not what she had been expecting. make it official. she as she finished chewing the mouthful she had taken before she could feel him looking at her. and she could feel herself blushing. once again she was grateful that he would be unlikely to see it. she swallowed and smiled as she turned to face him. "Of course. I would like that a lot" she said. it didnt feel fast two her. they had been friends for ever even if they hadn't seen each other for a while. and they had gone out a couple of tiems already even if they weren't dates. she shook her head a fraction as he said that she was amazing. no she wasnt amazing. she would like to think that she was good. but amazing wasn't a way she would describe herself. "we aren't moving that quick. and you are one of the coolest people I know." she said. she wondered if if they had been closer in age they would have dated at school. his next statement she could agree with. "It certainly feels like the right thing to do." she said. so why waste time on waiting. the added mentally as she took a couple of her chips. feeling the warm salty taste adding to the slightly wistful weightlessness she was feeling. She felt like she should say something but wasnt sure what. two topics came to mind one was what they should do for a next date. and the other was work related the dismissed the first one because that would make it feel like today was almost over and she wasnt ready to think about it like that. the second she dismissed because work was too much of a mundane topic after such a fun day. Her dilemma was solved when a seagull swooped down and tried to steal one of her chips. Shoo" she shooed it. waking at the bird. this didnt detract it, instead, it had resulted in her dropping a couple more chips and attracitn another couple of squawking birds. she waved her feet at them to try and shoo them away but the amount of good it did her was nothing at best. "seagulls must be the most persistent creatures ever" she said managing to make them take a few steps back even if it didn't scare them away altogether. Tybalt had moved his gaze a little away from her as he’d waited for the response. He wouldn’t have minded if she wanted to take it a little more slowly, he wanted to move a bit quicker, not seeing the sense in waiting around. They were young enough, busy professionals who didn’t have a whole lot of time. But she replied and said that she wanted to, that she wanted to give them a real shot at a proper relationship. He would be her boyfriend, he was now her boyfriend. Maybe those labels were a bit childish and it made him feel a little giddy as he took a bite of his food. They had come so far, their relationship over the years had taken so many forms, but he was glad that they had reunited, that they’d gone out and that they had had the chance of it all coming together at that point to mean what it did. It might not have been possible, but they had now, they were letting things happen. He was glad too that she didn’t think they were moving that fast, even going so far as to call him cool, ”Aww, you think I’m cool,” he teased with a little chuckle, ”My nieces and nephew don’t even think I’m cool anymore,” the healer could admit that they did find him a little cool, but they hadn’t said it in a while. Rhiannon wasnt sure what Tybalt was thinking but she was thinking that she was happy that things were turning out well. she was kicking herself for cooling him cool. it was true of course. but it sounded so childish. why hadn't she found a better adjective. Tybalt responded to her comment she chuckled. glad that he didn't say anything about it. "They are clearly missing out. I thought aunts and uncles were always meant to be the cool relative" she said. her aunt certainly always had been. what was not cool about an aunt who lived on mull and was a silversmith and the only other witch in the family. she shook her head as he said that she was the seagull chase master. "they will be back soon" she said. his next comment gave her an idea. she didn't want to hurt the animals. but she also didn't want them to take her dinner. she had an idea on how to shoo them next time if they came back. wandless maybe even none verbal magic could be used to make a quick jet of air to scare them off and leave nothing that anyone would be able to tell was magic. Thankfully it seemed that the birds had decided that a family just a little further along them had a better picnic and a young girl who seemed to enjoy throwing bread to them. "or maybe that little girl will keep them distracted for us" she said. they spent a few minutes in quiet each to their own thoughts. as they ate. rhiannon was admiring the view and thinking about what kind of date they should do next. something magic related. not that today wasn't a magic day in its own way but it would be good to start getting her feet back into the magical world a little. especially now he was seeing Ty. she finished her food and put the wrapper into her bag before shuffling a little closer to Tybalt now they didn't need elbow room to eat "It is nice here." she said. this little peninsula containing the lookout and botanical gardens in the middle of the city overlooking the harbour. a peace of calm in the middle of the metropolis. Rhiannon smiled when Tybalt said that he will swing back around to being cool again in his nephew's eyes. she nodded but didn't really have anything more to add to that train of conversation. she hoped that then her brother had kids she would get to be the cool aunt. she wasn't sure how she would be cool. short of breaking the statute of secrecy she was not a particularly interesting person. not like her aunt who was a silversmith and taught her how to make things out of the metal. even if it had been a long time since she had had a go but it was a skill that she was proud to have learned. As Tybalt said that she may have lost her title of master seagull chases she put her hand to her chest as if she had been shot in the heart. "you cut me deep. how will I ever survive no longer being the master seagull scarer" she said pretending that she had been deeply betrayed. before she winked and leaned towards him as she felt his arm wrap around her. she looked at the sky, the sunset was starting to get darker now. the colours seeking from bright fire to glowing ember. "mm-hmm" she said as her boyfriend said that it was nice here. "the company makes it even better" she added giving him a kiss on the cheek. "where did you want to travel when you were at school? maybe we could organise our next date to go somewhere you haven't had the chance to go to" she said wondering what kind of places he had wanted to visit. she would be happy for any kind of trip. she had not really had the chance to travel much but would like to see more of the world than the united kingdom, Australia and New Zealand. 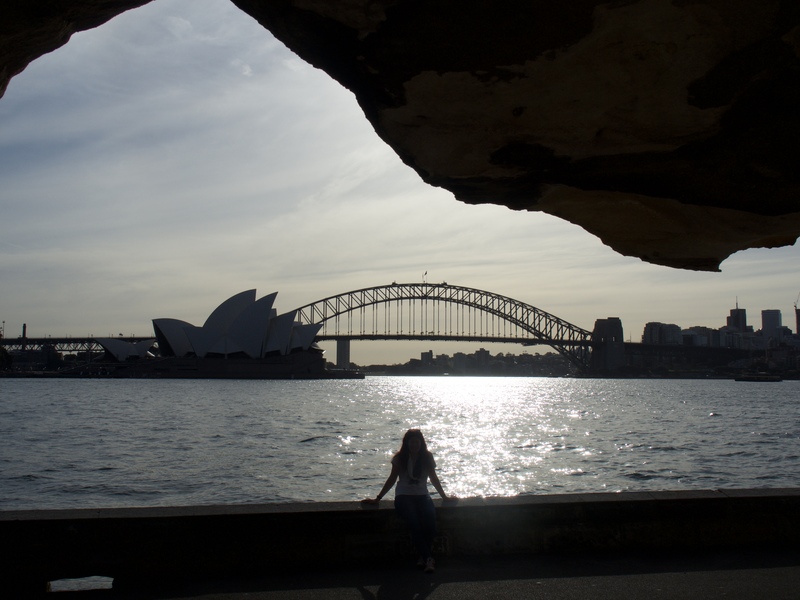 Rhiannon smiled she could not think of anywhere she would rather be than right here right now here watching the day fade into the night in Sydney with Tybalt. she looked at him and saw him smiling at her. she smiled back she started to think of places that she had wanted to go to as she listened to Tybalt list his. "They all sound very interesting places, i would not have thought Johannesburg, what do you want to see or do there?" she said she vaguely knew it was in South Africa but didn't know more about the city than that. she was expecting his next question not that she had thought of much of a response to it. "I don't know. London and new york would be good to visit, but I have never thought much about travelling. maybe It is the Hufflepuff in me but I have been far to busy working" she said. it had been a good while since she had referred to the Hufflepuff in her. whilst mote other houses thought of Hufflepuff are being kind and friendly there was more to them than that. in fact, friendly and nice were not their main traits. bu loyalty and hardworking. and it was this last trait that she was referring to. "It would be nice to visit somewhere in the Mediterranean, maybe Italy. rome has so many famous places" she added. thinking of all the landmarks. and all the movies she had seen set in Rome or Italy. and the beautiful countryside, that looked frozen in time.